Fancy places the fourteen year old Fancy Greene on her family farm near Florence, Alabama. This resourceful, smart young lady works the farm and cares for her younger sister, Danni. To make matters worse, not long after the story begins, she is notified that her dad has been killed in battle at Manassas Junction. None the less, Fancy determines to finish planting for the crop that should provide for their needs. Her life becomes complicated by a lecherous preacher who will stop at noting to make Fancy his wife. When he is rebuffed by Fancy, the preacher turns to a neighboring property owner who wants the Greene property for himself. The two conspire to take the Greene property. The preacher tells the neighbor he can create a false deed, sign the document as a witness and get the deed certified by the local judge. 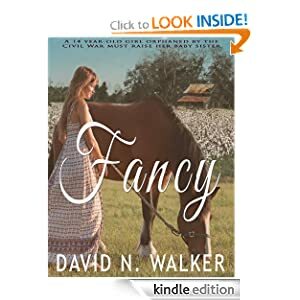 Fancy isn’t the push-over the preacher hopes for and no one counted on Fancy finding a friend of her dads who seeks justice on Fancy’s behalf. I found Fancy to be an endearing, well crafted story that has much in common with classic literature. I highly recommend it and I’m eager to read the complete series. I’ve become a fan of David N. Walker. David N. Walker is a Christian husband, father and grandfather, a grounded pilot, a would-be Nashville star, and a near-scratch golfer who had to give up the game because of shoulder problems. A graduate of Duke University, he spent 42 years as a health insurance agent. Most of that career was spent in Texas, but for a few years he traveled many other states. He started writing about 20 years ago and has been a member and leader in several writers’ groups. Two of his books, the devotional Heaven Sent and the novella Fancy, are now available in paperback and in Kindle and Nook formats. Fancy: The Search is the second novella in the Fancy series. It’s wonderful to see that the movement to sterilise the author’s voice from their writing, to focus solely on plot and not the ‘feel’ of the setting or piece, hasn’t reached everyone’s writing. Kudos to David for preserving his voice. I’m with you on that. I loved the classic feel and solid character development David gave the story. Very good review. I’ve got in here with a bit of luck, but I think that I will read the book this weekend. Thank you. I’m sure David Walker appreciates it as well.